Kate proudly partners with nonprofit organizations to discover opportunities to enhance organizational capacity. Her approach centers around a concept she has developed: Embedded Strategy Organizations. These organizations maintain focus on strategic priorities aligned to their organizational mission within ongoing operations and activities. Rather than pausing to plan, they engage their network and resources to create impact toward their mission and goals through strong structures and systems designed to achieve long term stability and proactive governance. 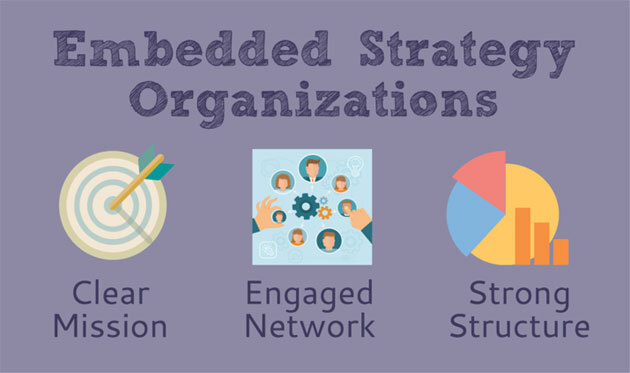 Embedded strategy organizations cultivate an intentional culture and practices to reflect their mission and core values. Each organization reflects a clear mission, engaged network and strong structures. Kate created a simple tool to explore your own opportunities to enhance Embedded Strategy. The tool can help identify areas of strength and opportunities for growth. Kate’s work is grounded in nonprofit governance best practice, informed by current research, and connected to each unique organization and the community they serve. Blending her legal perspective, nonprofit experience, and embedded strategy approach, Kate works with her clients to enhance internal capacity in each project no matter how large or small.